Cannabidiol, or CBD, has been growing in popularity. 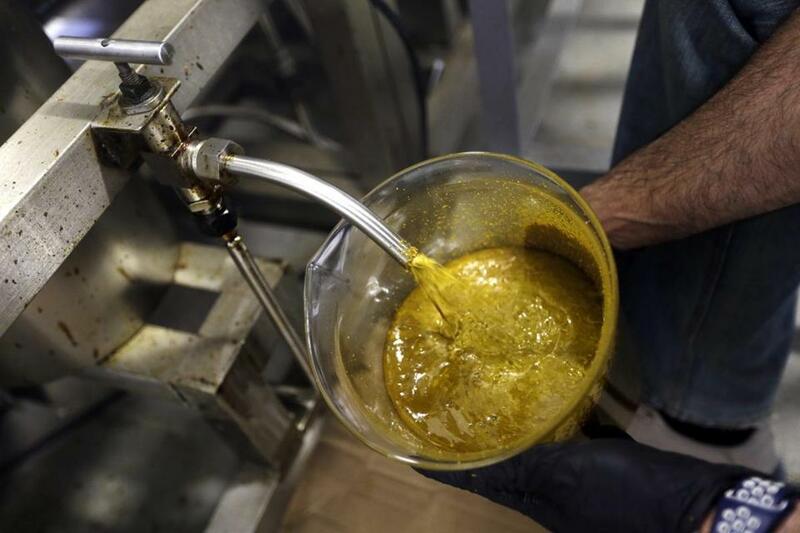 Above, the oil being extracted from hemp. Some see CBD as a more “legitimate” cannabis product, because it doesn’t contain tetrahydrocannabinol (THC), the psychoactive compound in cannabis that makes users feel high, yet has many reported health benefits. When most people think of the euphoric effects of marijuana, it’s the THC they are referencing. CBD relaxes people without intoxication. Both marijuana and hemp are from the same cannabis plant family, but they are distinct and are used in very different ways. Marijuana is well-known as a recreational and a medicinal drug; hemp has many industrial applications, including being used to make clothing. The CBD in many of the products taking the market by storm is from the hemp plant and has very little or no THC component at all. As CBD is added to more and more products, it’s possible that people could take a larger than suggested dose by accident. For example, if you took a supplement, used a topical cream, swiped on some lip balm, swigged a seltzer water, and snacked on a pack of CBD coconut bites you could easily ingest hundreds of grams of CBD. But does that matter? CBD is nontoxic, and a 2011 study by the University of Sao Paulo found that even high doses of up to 1,500 milligrams a day were well tolerated. In 2017, the World Health Organization released a report that said CBD was not addictive or harmful. For consumers who want to try CBD products, the advice is to start slowly with a low dose and monitor the effects before taking more. CBD use should be discussed with your health care provider, especially if you take any other medications. One of the potential dangers is the possibility of a poor-quality product entering the market, said Max Simon, CEO and owner of California-based Green Flower, a platform of more than 600 cannabis experts who provide information and resources to the public. “Unfortunately, the CBD market is not regulated, and consumers are running into a lot of inferior products; you can’t always be sure what you’re getting,” he said. According to one report, 70 percent of the unregulated CBD products on the market are inaccurately labeled. Dr. Matthew Mintz, an internal medicine physician in Bethesda, Md., suggests CBD to some of his patients, but the lack of oversight concerns him. “Even as a physician it is challenging to know which products to recommend, since CBD is not nearly as regulated as medicinal marijuana,” he said. In Massachusetts, CBD can be purchased at health stores and gas stations as pills or gummies. Licensed medical dispensaries can sell products from the state-regulated supply chain. ■ Purchase branded products only from a reputable company that has experience in manufacturing and production. ■ Understand where and how the hemp that the CBD is coming from is sourced. ■ Request the batch-testing results from the manufacturer associated with the specific product. Testing results will confirm the potency and purity of the product. CBD is found in oils, gummies, supplements, and a growing body of new products such as mints from Lucent Botanicals in Oakland, Calif. The company’s CBD mints contain 10 milligrams of CBD per serving and are said to reduce pain, calm users and boost their mood, and promote more restful sleep. Shea Brand, of New York, makes a regular natural CBD pain reliever, but with the addition of shea butter it does double duty as a moisturizer — and stylish packaging makes it look more like a high-end cosmetic than a medicine. The company also offers a lip balm and oil drops. Medterra, of Irvine, Calif., produces a topical cooling cream for sore muscles, in 250 milligram or 750 milligram strengths. And Boulder, Colo.-based Weller makes CBD-infused foods, including their original or dark-chocolate Coconut Bites, which offer 25 milligrams of CBD. Weller founders Matt Oscamou and John Simmons said the interest and excitement in CBD are palpable. “It’s reminiscent of early natural-products days, when innovation was rampant. We see CBD as the ingredient of the century and expect it to eclipse any other single ingredient trend we’ve seen throughout our careers,” they said. Weller plans to sell CBD-infused sparkling water in three flavors, joining Queen City Hemp in Cincinnati, which produces an additive-free all-natural CBD-flavored seltzer water that contains 5 milligrams of CBD per serving.